Direct Gas heating system: Easily accessible burner arrangement with optimum fresh air supply. Automatic burners with higher turn down ratio leads to energy saving. 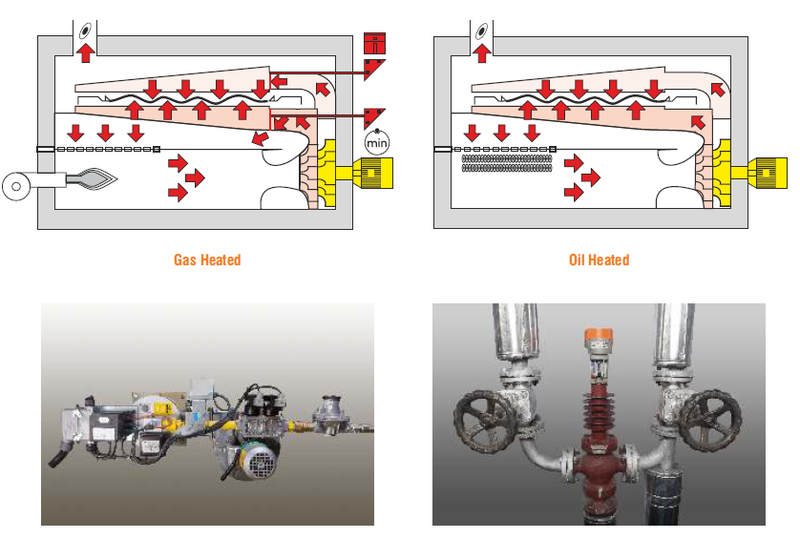 Indirect Thermic Oil heating system: Large heat exchanger surface areas for quick heating. Uniform heat transfer and lesser pressure drop across heat exchanger due to its unique design. PID controlled Motorised valves are offered for better temperature control and energy saving. Indirect Steam heating system : Large heat exchanger surface areas for quick heating (Optional). Direct Gas Heating - Easily accessible burner arrangement.